2015 is the year that phenom Bryce Harper has finally solved his injury bug and taken over the National League. Bryce Harper has simply dominated the league this year, so does he deserve the National League MVP? In simple terms, yes. Yes, he does. By comparing him to his main competitor in the NL, Paul Goldschmidt, we can put to rest who deserves the title of the Most Valuable Player. Also, besides the two sluggers, Zach Greinke and Clayton Kershaw have been extremely valuable to the Dodgers, however, for the sake of looking at pitchers when looking at the Cy Young award exclusively, I’ll simply stick to the batters. Make no mistake, however, pitchers can win this thing, as shown by Justin Verlander’s 2012 season and Clayton Kershaw’s 2014 season. And Zach Greinke and Clayton Kershaw and other flamethrowers have a chance to challenge the sluggers of the NL for the crown. Now, let’s get down to business and put up the numbers for Harper and Goldschmidt. These stats are up to August 29, 2015. There is still a full month of baseball to be played, but there’s a lot that we can take in from this breakdown. When looking at the three main traditional categories, Harper has the advantage in home runs and batting average, albeit slim. Goldschmidt, on the other hand, has a full 20-RBI lead over Harper. Both of them are in the same range when it comes to runs and hits. Goldy has swiped 14 more bags than Harper has this season. Voters like an all-around player, and Goldy’s speed is a plus for him. In slugging and on-base percentages, Harper owns slight leads in both categories. When looking at WAR, Harper cannot be matched by anyone in the major leagues this year, leading the MLB with a 8.07 WAR after nearly 5 months played. 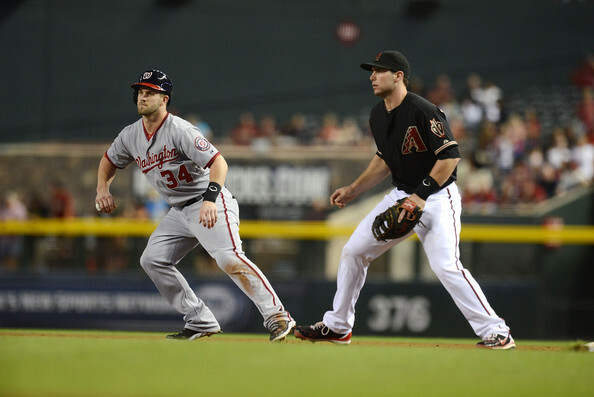 Goldschmidt, even though he plays first base, owns the upper hand defensively based on defensive WAR. Although the popular word right now is that Harper is the clear-cut MVP this year, I’m surprised to see that Goldschmidt has been almost as good as him in certain categories and better in others. Of course, both players’ teams, the Nationals and the Diamondbacks, don’t look to be headed for the playoffs this year. So that factor won’t decide the winner here. As of now, Harper is leader. But he has to watch out. If Goldschmidt can continue to rake, and Harper falls off a bit in the final month of the season, this will be an incredibly close race to watch. So, who do you think deserves this year’s NL Most Valuable Player? The American League MVP race is going to be closely watched for the last 6 weeks or so of the regular season. As of now, there are two clear cut candidates for this year’s American League MVP. On one hand, there is the incumbent Mike Trout of the Los Angeles Angels of Anaheim. On the other hand, there is first-year Toronto Blue Jay, Josh Donaldson. Let’s take a look at the breakdown between the two players. After looking at the stats for both Trout and Donaldson (up to August 24), is there a clear cut winner yet? Donaldson holds slim leads in batting average and home runs, and has a sizable lead in runs batted in. 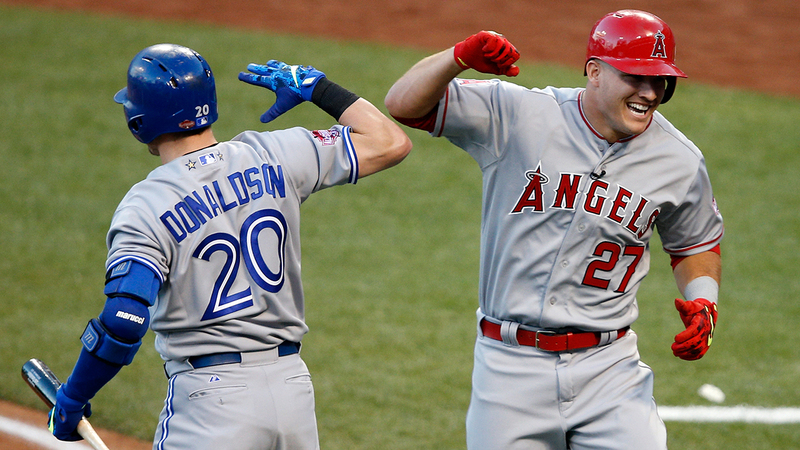 Trout, however, has higher slugging and on-base percentages than the Toronto slugger. Looking at the saber metric side, Trout has the most offensive WAR (wins above replacement) than any player in the MLB, and his total WAR is second to only Bryce Harper. Donaldson isn’t far behind in total WAR, and is better defensively according to WAR. When voting for the MVP, voters often look at the player’s team status as in whether they qualified for the playoffs or not. This hurt Trout few years ago when going against Miguel Cabrera in 2012-2013 in the MVP conversation. The final winner between Donaldson and Trout could depend on if the Blue Jays and/or the Angels make the playoffs or not. As of this moment, the Blue Jays have the AL East lead after acquiring big name players at the Trade Deadline. They would be playing the Houston Astros if the season ended right now. The Angels, on the other hand, have lost hold on the second Wild Card spot, and they are in third place in the AL West behind the division leading Astros and second Wild Card holder Texas Rangers. So, after looking over the comparisons between Trout and Donaldson, who do you think should win the Most Valuable Player award for the American League? Sound off in the comments and vote in the poll! Welcome to the latest addition to an already amazing community at BuntHuddleKick.com! BHK Insider will deliver articles about the latest headlines in sports and Topps. Want to check out some of the latest news for the MLB postseason? There will be articles coming soon that cover that. Want to see some of the newest features on the new KICK 16 that could transfer to upcoming HUDDLE as well? We’ll be covering that as well. Check out all the latest news on sports and Topps here at the new BHK Insider! We hope you enjoy it!